Home » News » Danielle Robinson replaces Judd Pittman as school board president. Danielle Robinson replaces Judd Pittman as school board president. Danielle Robinson returned to her post as president of the Harrisburg School Board tonight, ousting incumbent Judd Pittman in a 6-3 vote at an annual reorganization meeting. Lola Lawson, a board veteran who was appointed to a temporary seat in August, will serve as vice president. A member of the school board since 2012, Robinson served as its president from 2015 to 2017, when she lost her leadership role to Pittman. She was subsequently elected vice president for the 2018 calendar year. 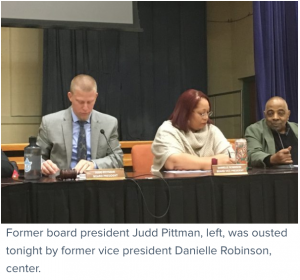 Robinson and Pittman found themselves in opposite factions throughout most of 2018, as the board decided whether to retain superintendent Sybil Knight-Burney or conduct a nationwide search for her replacement. The board frequently split along slim margins on questions related to Knight-Burney’s tenure and administration, with the majority supporting her. Following the resignation of two board members earlier this year and the appointment of two board veterans to replace them, the majority that consistently supported Knight-Burney grew from five members to six. The members of that faction — Robinson, Lawson, Melvin Wilson, Ellis Roy, Lionel Gonzalez and Patricia Whitehead Myers — all voted for Robinson tonight. Board directors Carrie Fowler and Brian Carter voted for Pittman. Pittman also cast a vote for himself, even though he nominated Carter to serve as president. Robinson assumed her leadership position as soon as the vote was complete and presided over the remainder of the reorganization session. She nominated Lawson to serve as her second-in-command. Pittman again nominated Carter for the vice presidency and cast a vote for him, even though Pittman himself got a nomination from Roy. Lawson ultimately won the vice presidency with five votes from her colleagues. After the reorganization, Robinson said that her priority in the new year is to unify the board and restore order to its meetings, which at times this year devolved into shouting matches over questions of policy and procedure. Robinson said that she hopes to make meetings more efficient so that directors do not have to deliberate or argue over agenda items. She said that the discord over the last year arose when board directors arrived at meetings unprepared to vote. But the Pennsylvania’s Sunshine Act, which governs procedures for public meetings, requires all business by elected officials — including deliberation and votes on policy matters — to take place in view of the public. Only certain topics, such as litigation, negotiations on collective bargaining contracts and personnel actions, may be discussed in a closed-door “executive” session. The topics discussed in executive session must later be disclosed at a public meeting. Robinson conceded that the board’s committee structure can be improved to help board members prepare for general meetings. She also said that she’ll take a more decisive bent than her predecessor in contract negotiations, which are currently underway with the teachers union and Knight-Burney. Knight-Burney is currently employed under the terms of her old contract, which expired on June 30. The board voted 5-4 this spring to renew it for a three-year term. The board’s annual reorganization came on the heels of news that test scores in the district declined during the 2017-18 school year, falling well below the benchmarks outlined in the district’s long-term recovery plan. Data released by the state Department of Education last week show that John Harris High School, the district’s largest campus with 1,050 students, logged a 49-percent graduation rate, compared to a statewide average of 86 percent. Only 16 percent of JHHS students demonstrated proficiency in English. 7.8 percent were proficient in math, and 10 percent proficient in science. Knight-Burney addressed the state’s new school evaluation system at tonight’s meeting, but notably did not mention any specific data. She did say that the performance of individual school buildings would likely garner them a new state designation: Comprehensive Support and Improvement (CSI) schools, a title reserved for institutions that perform poorly on academic growth and proficiency indicators. The designation will qualify the schools for additional guidance from policy experts and educational experts. Robinson said the district needed new strategies to improve performance in the coming year, but declined to outline specific proposals until she met with her colleagues. And while she agreed that the district could “absolutely” improve its academic performance, she also lamented what she saw as incessant negativity from members of the public. Robinson has been a subject of criticism this year from the citizen-led school reform group, Concerned About the Children of Harrisburg (CATCH), which emerged as an organizing force this spring while the board debated Knight-Burney’s contract. CATCH members have made clear their opposition to Knight-Burney, who they say has been slow to improve student performance and teacher retention during her seven-year administration. They’ve also criticized members of the school board, including Robinson, who they’ve said are too protective of her tenure. Robinson said tonight that CATCH could be an asset to the board, but that its members were too adversarial and even bullying in their calls for change. “You can’t say you want to help the district if you’re constantly down on the district,” said Robinson, who added that her son, a student at Marshall Academy, was being intimidated by classmates whose parents supported CATCH. Robinson said she is the only board member with a child enrolled in Harrisburg schools. That gives her a unique perspective among her colleagues, she said, and a vested interest in seeing the district perform at its best. She pointed to the establishment of the Cougar Academy cyber school and new career readiness programs as some of the district’s recent successes. She credited Knight-Burney with bringing fresh ideas and innovative STEM programs to the district and reiterated her belief that the embattled superintendent is the right person to lead Harrisburg’s schools. Robinson also suggested that the challenges facing the Harrisburg school district — low attendance rates, flagging test scores and meager graduation rate — were endemic to districts across the state. This story was updated shortly after publication to include additional information about the CSI designation for select Harrisburg schools. Next Post Harrisburg officials see "a light at the end of the tunnel" as they conclude busiest year yet for demolitions.